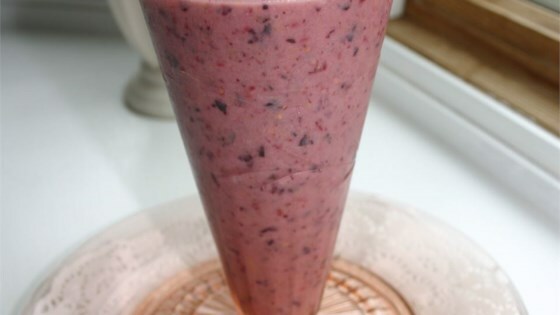 "Absolutely wonderful fruit smoothie with raspberries, blueberries, strawberries and more! I have this for breakfast every morning." Place the blueberries, raspberries, strawberries, pomegranate and mango juices, milk, and honey into a blender. Cover, and puree until smooth. Pour into glasses to serve. Delicious! I added a squeeze of lemon juice and also used just orange juice instead of the pomegranate and mango. Delicious! I had to tweek it a little, I didn't have mango juice and instead of milk I used vanilla flavored pure coconut milk. It tastes great!